In theory, something new usually sounds exciting, especially programs started by Naperville city officials. One of the newest programs is called “Adopt-A-Drain”. Participants volunteering will be known as Drain Defenders, that’s pretty catchy. The first 100 people signing up for the program will be provided with a free pair of gloves, a nifty rake and a cool reflective vest. The vest comes in handy in case you get hit by a car and land along the roadside. It’s much easier to be located that way. The idea is for residents to select a drain and keep it clear of debris in order to prevent clogged storm drains and thereby minimize street flooding. It’s actually a good idea, even if it only clears one drain, (preferably the one near my home). There are approximately 56,000 storm drains in the city, and 14,000 (25%) have been identified as culprits for causing problems. The city budgets $1.1 million yearly for inspecting, repairing, and maintaining drains, or about $20 per drain. If the program works, the program could be expanded to all 56,000 drains with 56,000 volunteers. No doubt volunteer training day at the Municipal Center would definitely be quite a site to behold. The City of Naperville has another program though not volunteered fueled. It’s the annual leaf pick-up program which is underway now. Here is how the six-week program works. 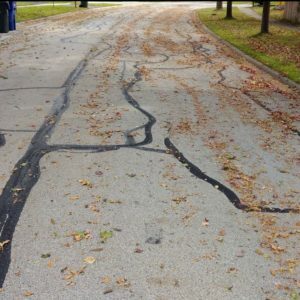 Beginning on October 15 and ending about Thanksgiving, every two weeks for three cycles, leaves which have been raked into the street at curbside will be picked up or pushed around the street. Which means the neatly raked mounds of leaves will either be “vacuumed up” by a truck or evenly redistributed back onto the street throughout your neighborhood. So a two-foot high mound of leaves will result in 1/4 inch of leaves covering the street. The leaf pick-up truck came by our neighborhood today. It’s easy to know it’s coming because it sounds like a WW-II German Panzer tank rolling through. If I didn’t know it was in the area, my two poodles would remind me when they run for cover. The truck picked up about half the leaves and the other half were re-distributed in front of my neighbors homes. Immediately afterwards, the garbage and recycling trucks came rolling through, smashing most of the remaining leaves into the pavement. It all seems to be well coordinated, with the end result being a newly brown colored street. The real problem occurs if it rains before pickup, and leaves find their way to the drain. It’s even worse during the third cycle if it snows and covers the leaves including all the leaf debris covering the streets from the previous two cycles. There have been times when the third pickup did not occur due to weather conditions. Whatever debris remaining on the street finds its way to clog the drain. So it comes down to this, it’s the Drain Defenders with rakes vs. the leaf re-distribution guys in German Panzer Tanks. If nothing else, city officials are providing great entertainment for guys like me. Wouldn’t it be nice if Naperville residents had an advocate to represent them during city council meetings. Someone who could ask questions and get answers. It’s become apparent after watching Naperville city council meetings for eight years that unless you are a resident with a bee in your birdbath, or unless you live on the same street as a council member, your voice is nothing more than background noise to city officials. It happened again at Naperville’s most recent city council meeting on October 16. The meeting lasted 3.5 hours and during the meeting the city council approved a two-year, $100,000 agreement with S.B. Friedman and Co. to represent the city as an advocate in negotiating and securing agreements with Ryan Companies for the development of the Fifth Avenue Project. In addition to providing service as an advocate for the city, it will be a buffer for city officials giving them another degree of separation for bad decisions that may result in the development of the project. One of those “hey, I didn’t do it” excuses that city officials like to use when something goes wrong. Utilizing an advocate for city officials is useful. Wouldn’t having an advocate for residents be useful for residents? This was followed by Napeville Mayor Steve Chirico trying to answer those questions. So far so good. However this is where it starts to go sideways when the mayor brings Electric Utility Director, Mark Curran into the conversation regarding Smart Meter “savings”. Curran is an artist when it comes to double-talk, utilizing the principal “if you can’t convince them with facts, dazzle them with bull—- ” The promise that Smart Meters would save rate-users money, has not materialized. Not one dime has been saved, not a nickel, not a penny. This was followed with some fuzzy math from Curran and the mayor. Since when is informing residents “wasting the public’s time”. I’m guessing the mayor would like to ‘have this comment back’ but video is unforgiving, once it’s out there, it’s out there. Typically Mayor Chirico is sensitive and gracious towards speakers, so this may qualify for a ‘mulligan’. No doubt it was out of character for the mayor. Electric rates, up or down, have direct impact on every Naperville resident and business. The council spent “wasted” 53 minutes talking about approving another car wash on Ogden Avenue, but couldn’t invest another 10 minutes informing resident Jim Hill and the tens-of-thousands of rate payers about his questions and concerns. Inviting resident Jim Hill to the mayor’s office for dialogue is cool for Jim Hill, but what about the rest of us. Can we all line up at the mayor’s door to get the same information. Hence why not have an official position of Residents Advocate at the municipal center. Some one who can get answers during the council meeting that all of us can hear. Someone who has the best interests of Naperville residents in mind. In theory, each and every council member should be an advocate for residents, but in actuality, unless you have that bee-in-a-birdbath, it’s not happening. Council members seldom speak up in support of residents, and seldom challenge each other with stimulating questions and conversation, they tend to walk in lock-step and vote in unison. Interestingly, this electric rate change could result in a slightly lower rate. I don’t suppose that has anything to do with the upcoming municipal election in 162 days could it? It worked in the 1989 movie, ‘Field Of Dreams’, “if you build it they will come”. Now Naperville city officials are banking on the perk, ‘If you pay them they will stay’. The City of Naperville is doing something most municipalities do not do; they are offering city employees a bonus program. The idea is two-fold, 1) give recognition to employees for a job well done, and 2) retain top employees thereby reducing turnover. Naperville budgets $150,000 per year for bonuses, and bonuses range from $5 up to $1,000 with an annual limit of $2,500 per employee. The program has been existence for five years averaging about $70,000 per year in bonuses. Budgeted bonus dollars not used go back into the general fund. Just because the dollars are there doesn’t mean the money has to be used. Kudos for city officials for not using all the dollars available. Unrealistic expectations. Providing bonuses can create a new benchmark which becomes the new norm. Employees can feel disappointed if they receive a bonus one year, and less or nothing the following year. It can result in a morale deflater. Fostering employee competition. Rather than employees working together as a team, they can see it as competition with each other resulting in unintended consequences. Bonuses are taxable. Employees can be disappointed when they realize the bonus is less than originally stated. If this bonus/incentive program doesn’t work out, Naperville city officials can always revert back to the old way of doing things. The top-third of employees get a $25 gift card, the middle-third get to keep their jobs, and the bottom-third get fired. Another option is to have the mayor or city manger give a motivational talk to city employees. It’s becoming a yearly event in Naperville, conducting more studies, with more expense, for city officials to figure out what to do with Moser Tower, which houses the Carillon. Watchdog has done a few postings about the Tower and its bells (The Carillon) during the past few years, and nothing has really changed. The estimate to demolish is about $660,000. Considering the Carillon has 72 bells, if city officials could auction and sell each bell for $9,166.67, that would cover the cost of demolishing with 24 cents left over. Ticket sales would be clear profit. Rather than continuing to hire consulting companies (two companies totaling $168,000 over the last two years) providing no clear direction, simply hire a marketing company at a fraction of the cost, and be done with it. Chances are city officials already know what they want to do with the tower which is to keep it at all cost. No city official wants to take the responsibility of making the wrong decision. Hence more studies, more expense, and less direction. If they let it collapse, then an ‘autopsy’ of sorts would confirm what studies have been unable to do, which is to determine what the problem was. However, sticks of dynamite would take everybody off the hook, while creating a memory that would last a lifetime. Let the auction begin, do we have a bid on a bell?